2 2 0 1 7 W A T E R Q U A L I T Y R E P O R T CHATHAM WAKE J O R D A N L A K E I N TA K E L O C AT I O N R D U A I R P O R T C A R Y R T P MORRISVILLE C A R Y A P E X C A R Y / A P E X W T P DURHAM CHATHAM DURHAM WAKE THE LAST YEAR HAS BEEN ESPECIALLY SUCCESSFUL FOR CARY'S WATER SYSTEM. In 2017, our water system maintained another exceptional year of service excellence culminating with our 14th consecutive Partnership for Safe Water Directors Award. Our dedicated team of water system operators takes great pride in providing excellent water quality to our citizens, which is supported by conducting over 50,000 water quality tests per year. Cary staff closely monitor and respond to an ever-changing matrix of source water conditions to provide high-quality drinking water that consistently achieves high standards for water quality excellence. It's also very important that our drinking water tastes great, and I am pleased to report that Cary's water placed in the top three water systems for best tasting water in North Carolina. IT HAS ALSO BEEN A YEAR OF PLANNING FOR THE FUTURE. The long-term effort to plan, design, permit and construct an expansion of the Cary/Apex Water Treatment Facility is nearing completion. The facility expansion to a capacity of 56 million gallons per day ensures the needed capacity to serve Cary now and well into the future. In 2017, the Town secured from the State long-term water supply allocations from Jordan Lake for the next 30-year planning horizon. WE HAVE ALSO WORKED TO ADDRESS MORE IMMEDIATE CHALLENGES SUCH AS WATER SYSTEM RESILIENCY. In this report, more extensive information is provided about the Town's efforts to ensure our water system has the needed storage, pipeline infrastructure and treatment capacity to maintain continuous service to the community during emergency operating conditions, such as water main breaks. 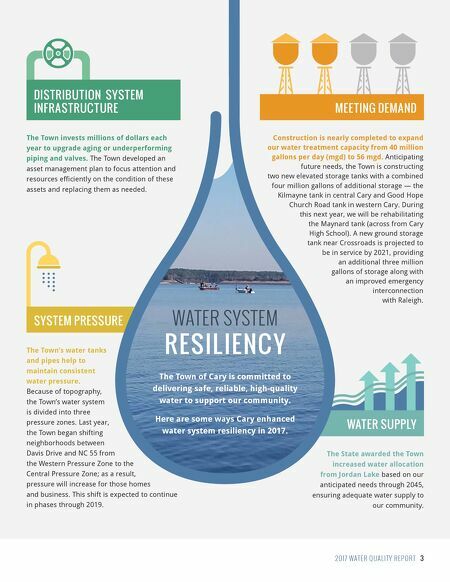 The water system is fundamental to Cary's investment in the future, and we are working on multiple fronts to ensure the Town's water system infrastructure is ready and prepared to embrace the future. 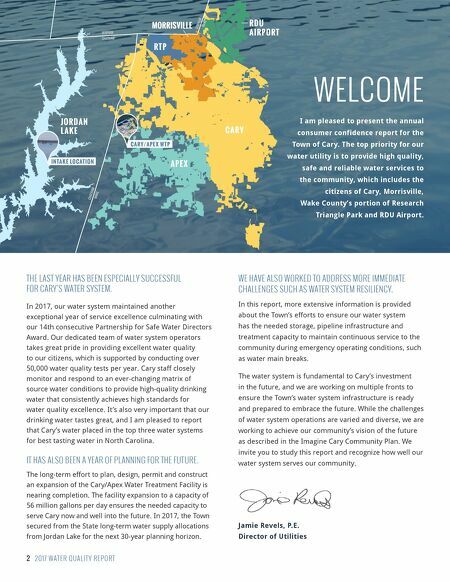 While the challenges of water system operations are varied and diverse, we are working to achieve our community's vision of the future as described in the Imagine Cary Community Plan. We invite you to study this report and recognize how well our water system serves our community. Jamie Revels, P.E. Director of Utilities WELCOME I am pleased to present the annual consumer confidence report for the Town of Cary. The top priority for our water utility is to provide high quality, safe and reliable water services to the community, which includes the citizens of Cary, Morrisville, Wake County's portion of Research Triangle Park and RDU Airport.